I'm so excited you're here with this journal committing yourself to 30 days of self-love and exploration. In a perfect world, maybe you wouldn't need a 30-day challenge to find and fall in love with your most playful, imaginative, and colorful self, but we don't live in a perfect world. We live in a fast-paced, info-packed myself, high-octane society where feeling lost in the jostling crowd is the norm and locating our own significance is sometimes the biggest challenge of all. During a particularly difficult time in my life, when I was struggling both professionally and personally, I used my blog to publicly commit myself to a Year of Fearless Love. I went into that year needing to believe in the power we all have to touch, lift, and heal each other. My goal (though I don't know if I could have articulated it at the time) was to prove that hypothesis true. Every month I gave myself a challenge. I hugged strangers: performed acts of mushy, unabashed gratitude:, and left anonymous notes of encouragement in unexpected places. I blogged about my activities, and over the course of the year, others joined me. By the end of my experiment, there were people loving more fearlessly all over the world. In Connecticut, a woman with cancer texted love relentlessly, until she broke through her own feelings of resentment and anger. In Canada, a woman began her own project: a Year of Hugging Fearlessly. She hugged people all over the globe and posted photos of each embrace. 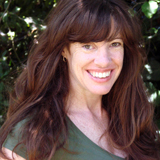 In Portland, a woman decided to take a chance on love. She's married now. In Romania, a woman blogged right along with me. She did every challenge I did and wrote about each one. She reminded me of how far love can reach. I learned so much during that time, but the thing that surprised me most was how much easier it was for people to turn their love outward. They had no trouble writing love letters and performing random acts of kindness . . . until the moment I asked them to redirect that loving attention to themselves. It broke my heart to see how people struggled to show themselves the same sort of sweetness and patience they so willingly showed to others. For a whole host of reasons, all of them seemingly justified, we put ourselves last day after day. We spend so much time being there for our friends and our families, our colleagues and our neighbors, that there is precious little time left over for taking care of ourselves. It's hard to break that habit of unhealthy selflessness, in part because our society encourages it. Tell people how busy you are, how much work you have to do, how many deadlines are looming, and they will smile sympathetically. They know your pain. By contrast, it's uncomfortable to talk about self-love. Tell people you're maneuvering your own personal, breathtaking evolution and they will look at you like you just announced you're marrying a hamster. But here's what I know for sure: At the center of every truly important and meaningful thing we do, there is love. It connects us to each other and to our planet. It fuels our best work and our bravest art. In the final moments of our lives, how well we loved will be the measure of how well we lived. And all love begins with self-love. It is a miraculous and wonderful truth that when you learn to love and value yourself, your relationships with everyone else change, because the you that you bring into those relationships is the fullest, truest, best-loved version of yourself. So this journal is about filling your well. It's about inviting yourself to play, and in the process, discovering once and for all the undeniable awesomeness that is you. This journal absolutely, positively doesn't have to be completed in 30 days. In fact, almost all of these activities can easily be stretched beyond one day, into their own 30-day challenges, or (better yet!) into lifelong practices. The point here is to love yourself with all the heart, creativity, and good humor you can muster. If it takes you more than 30 days, all the better! ©2017 Judy Clement Wall. All rights reserved. 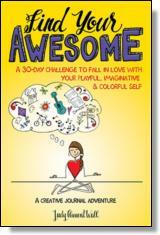 Reprinted from Find Your Awesome: A 30-Day Challenge to Fall in Love with Your Playful, Imaginative & Colorful Self. No part of this publication may be reproduced, stored in a retrieval system or transmitted in any form or by any means, without the written permission of the publisher. Publisher: Health Communications, Inc., 3201 SW 15th Street, Deerfield Beach, FL 33442.